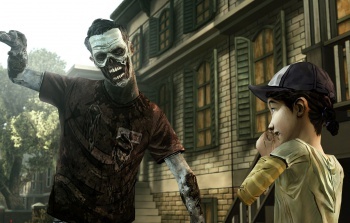 Telltale Games will finally produced a new series based on its own, original IP. Some big news coming out of Sam and Max developer Telltale Games. First up, there's a new boss in town, as President and Co-Founder Kevin Bruner has ascended to become the new CEO of the company. Next up, Telltale has announced plans for a new game based on... an entirely original IP! After Telltale achieved runaway success with it's fantastic take on Robert Kirkman's The Walking Dead, it quickly became known as "those guys who make adventure games out of existing IP", announcing plans last year for Game of Thrones, Borderlands, and even Minecraft adventure games. But, with the exception of the lesser-known (and considerably less popular) Puzzle Agent, Telltale has never actually produced an adventure game based on its own, original IP. But that's set to change with the new boss, who stated that "We're already working on some of the biggest franchises in entertainment, and when you add our unannounced partnerships and upcoming original IP, it's clear the most exciting time to be at Telltale is now, and there will continue to be more and more opportunity to innovate ahead of us," in an official statement. Additionally, Telltale confirmed to us that a third season of The Walking Dead in partnership with Skybound Entertainment is also in development, though it wouldn't give us any further details or release windows. Looks like an exciting year for Telltale fans is in store for 2015! Glad to see they're getting all the franchises. I'm far more excited for a Walking Dead Season 3 than the actual Walking Dead series or comics. That's not a surprise, their games are more entertaining then either the show or comic. I will probably buy up Season Three the moment it comes out and eagerly await the first episode. So they're going to keep everyone waiting longer for the franchise games they actually want to see so they can work on their own things? I snark, partially. I think it's great that they want to work on their own properties, and it wouldn't surprise me that being able to work on something that they have complete creative control over is important to prevent their people from becoming burnt out on the restrictions that are undoubtedly part of working with a popular licensed property. But at the same time, I'm actively hesitating to buy new TellTale games until they're several episodes in, just because I get so tired of waiting for them to move on with the projects they've already started. Let's hope they'll finally make a new engine. I really liked Puzzle Agent, I have both of them and I am gutted they never made a third. I highly recommend it for those who haven't tried it before. That said I'd love to see an new Sam & Max someday, but I am interested to see what a new IP could be. didn't like sam and max, but excited for the new Walking dead. The cynic in me will say that we dont want a new IP, we just want a game based on an existing franchise, but that being said, we never know what we want until we get it. For all we know, this new IP could be the best thing that TellTale will ever produce, but it has a long way to go if it wants to be Season 1 and 2 of The Walking Dead, in my mind at least. I have just finished episode one of tales from the borderlands and it was brilliant fun! Speaking as a person who got bored very quickly from the main games, this is pleasantly surprising. A new IP...could be anything. Hmmm so curious. Horror? Comedy? Biting satire? I dont care...just make it please! Telltale, I love you, but whatever the new IP and unannounced partnerships are, please for the love of god make or use a different engine for it. The one you're currently using is past its' best. I hope for a return to more traditional p&c games. I really enjoy their recent games, but seriously a bit of challenge would be welcome. otherwise they can wonder off into the night like a lost zombie for all I care. And CAN YOU PLEASE FIX PUZZLE AGENT 2???,TellTale? YES, please? What's wrong with your copy? I've been saying they need to start an original IP for awhile now. I'm excited! I don't really know what to think about Telltale at this point. I used to like their games before they turned into QTE-fests with little to know gameplay and every game after the first Walking Dead has had diminishing returns for me to the point I have no desire to even try the new Game of Thrones despite how big of a fan I am of the show. It just feels they've been trying to tackle too much and have been on a gradual decline for a while now. All I want from Telltale is another Graham Annable/Grickle game. Their recent exploits have all been games driven (to me) by merely above-average stories with mechanical bits added as an afterthought. Puzzle Agent was a complete reversal of that, and while it doesn't appeal to the "games as art" indie crowd that TT's current style does Puzzle Agent felt like a much more complete whole. The bizarre and engaging puzzles reinforced a bizarre, engaging world that reinforced the puzzles, et cetera. Puzzle Agent was a unique cycle of ludonarrative resonance, and there is very little else like it on the market. Therefore, I would like more of it, and less of Telltale's current fare. This is all well and good, but what about Sam & Max Season 4? If they're not going to do anything with that franchise, they might as well just drop it and let someone else do something with them. I won't deny that Telltale not only does one thing and does it well, they do it well in an industry notorious for doing it badly. But they also owe their success to quality writing, the same thing that tends to lead to good original stories, so this is maybe a project whose time has come. After Telltale achieved runaway success with it's fantastic take on Robert Kirkman's The Walking Dead, it quickly became known as "those guys who make adventure games out of existing IP"
Wait, then what were they known for before that? OS X Version, PA2 does not work for years now, while Puzzle Agent 1 does. I am not limited to OS X for my gaming but still, this show much of how TTG care.